A tour in town for the pelma members based on the work ‘The Speaker’. Several speakers will be placed in different parts of town that will be responding to our members music requests, be able to hold a conversation and guide them through directions towards there next performative destination. A full day of performances for the pelma members in the frame of ‘The Performance Shop’. Our members will be able to connect to their senses by visiting any one of our one on one performances and perhaps even stepping in the window of the shop themselves, being ‘on display’ for a while . We are celebrating fifteen years of our work with a mini festival which will include workshops, performances, video screenings of past works as well as the premier of our new piece ‘Stratum Anatomies’ a collaboration of artist Lia Haraki and curator/multidisciplinary artist Andrea S.D’Alessandro. A dinner for the pelma members based on the work ‘The Feast’. Our members will be invited to a dinner where extra- ordinary events will take place as the night unfolds in unpredictable ways. Creation usually implies the development of an idea in order to come to an end result, a process of constructing towards a presentation which can take different forms. In this 2 day workshop Lia Haraki will be giving participants another perspective to the creative process as a process of undoing rather than doing, removing the unnecessary so that the outcome can be revealed rather than developed. By using the onion as a metaphor participants will be guided to ‘peel off ‘ unnecessary layers that keep the art work hidden and locked. The particular workshop will be a journey of mapping artistic desires and creative ideas, developing skills related to choice making and gaining an understanding of the essential as necessary. The workshop will include physical and vocal practices and theories related to the creative process so that artists can reflect, share and dive into the essence of their work. Written material and reading will be given to the participants as well as an opportunity for further private mentoring. ‘’By the end of The Onion, I could feel the sparks! Rania Glymitsa gives a breathtaking performance leading to afterlife. Lia Haraki and Christodoulos Panayiotou remember their first collaboration, Evergreen (2003) in dialogue with Dimitris Chimonas. They revisit the work with a different perspective, and they invite us to have a "backstage" sneak pick on a performance that still remains current. The Active Spectator will be presented at the Pop up festival in NIcosia on the 21st December for 2 shows (19.30 and 21.00). THE ACTIVE SPECTATOR is a participatory performance where the spectators (16 people) , are guided by the actor in a very organic way, to participate / play , in the different fictional situations proposed during the performance . The actor uses the actions and reactions of the participants as performance material for the development of the piece. The work therefore becomes a circumstance of co-creation between the actor and the participants. The Active Spectator will be presented at the Pop up festival in NIcosia on the 19th December for 2 shows (19.30 and 21.00). The Active Spectator will be presented at the Pop up festival in NIcosia on the 7th December for 2 shows (19.30 and 21.00). The Active Spectator will be presented at the Pop up festival in NIcosia on the 5th December for 2 shows (19.30 and 21.00). 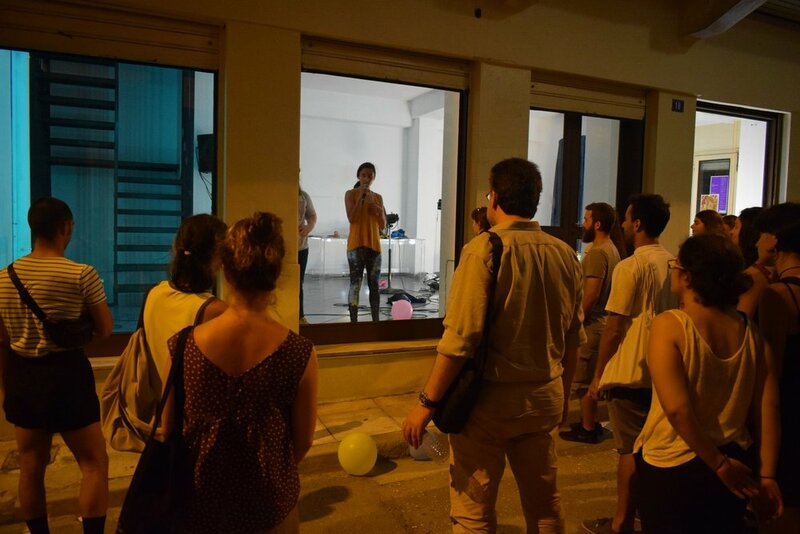 Closing of the Terra Mediterranea exhibition at Nimac with a performance of The RRR show. The Intunition workshop is a physical exploration of the basic principles used in the making of the solo ‘Tune In’ by Lia Haraki. The workshop includes meditation techniques, movement rituals and repetition as a tool for transformation. Life is random and so is Lia Haraki’s new piece. Two dancers and a composer “cook” the piece on the spot by mixing words sounds and bodies in order to create a universe of randomness. Creative movement improvisation classes for children of all ages! Taught by Lia Haraki with guest artists and educators Eleana Alexandrou and Arianna Marcoulides. WORD MARCH is a vocal duet which happens through the intense movement of the two performers who are not seen but heard. The piece proposes the physicality of word in an audible choreography where the performers are in a constant dialogue of simultaneous talking and moving via repetition and variation. Having won acclaim in recent years for his electrifying performances, director Aris Biniaris makes his Epidaurus debut in a production by the Cyprus Theatre Organisation, featuring a cast of talented actors from Greece and Cyprus.